For as much as I bitched about Mockingjay's epilogue, I kind of think that this book could have used one.This will be the review of can't really say jack.After all, how do I even talk about this book without spoilers? Warning : there are spoilers for book 2 in the comments section, so don't go there unless you've at least read up through book 2.I can probably at least say that fans of the trilogy will want to read Requiem so they can finish out the story.I just expected more than this and truly wish that I could give a glowing report. So who here has read book 2? Show of hands? For those of you who have, how many of you were hoping for a bunch of Alex time? Come on, I know I wasn't the only one. Sorry to burst everyone's bubbles, but I'll just say, "good luck with that." Oh, he's there. But again, I expected more. "Stop saying my name. You don't know me anymore. "asdfjasd;lkfjeiohrtaoipweuhrarhjeas;laeslk;rjaesrj;erYes, I am frustrated. I CAN'T SAY ANYTHING WITHOUT SPOILING. I can't write the review that I want to write.So instead, I'll make you sit and listen to elevator muzak in order to fill up some of the time in which you'd normally spend reading one of my ridiculously long reviews. Please HoldOh, I'm sorry, were you expecting more? Crap. Let me think for a moment. There has to be something random that I can say.Does anyone remember my reference to the Book of Shhh in my review of book 2? Can anyone explain to me why it now appears to be a reworked Bible? 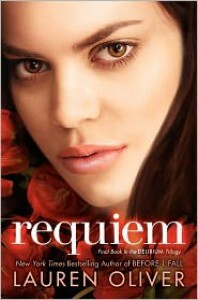 I suppose the there were some previous book/chapter/verse descriptions which were similar to those in the Bible, but the reworked story of Solomon in Requiem where the baby actually gets sliced in two was HI-LA-RI-OUS disturbing.Requiem is told in two different alternating PoV's from both Lena and Hana. Even though I didn't read the short story of Hana (2.5), I'd probably go ahead and tell you to read it, or at the very least look up a wiki or have a friend spoil it for you like I did, so you get the gist of where Hana's mind is at now.Hana's story was eh? Lena's story was eh? The way everything collided at the end was eh? Can problems such as these be worked out with so little effort? The ending was (I guess) sort of okay, but also annoyingly open. This is all I can mention. How about we make a deal? For everyone who is reading this trilogy, come back and tell me what you thought of that ending. Maybe I'm overreacting and you will all love it.If you haven't started this trilogy, should you read it? Maybe. Book 1 was exciting. Book 2 was alright. Book 3 was not necessarily boring...it just all comes down to being anti-climactic for me. Maybe you won't feel the same. I have friends who enjoyed the entire trilogy. This isn't the worst dystopia I've read; that's for sure. Btw, this is going to be a t.v. show. So if you like reading books before seeing the story play out on film, then you'll be wanting to pick this up anyway. Sorry for the lame review. I can't get it right every time.